The nuchal translucency test is a safe and simple test performed towards the end of the first trimester of a pregnancy. It comprises a blood test and an ultrasound scan and is likely to detect approximately 85 – 90 percent of chromosomal abnormalities, the most common of which, is Down Syndrome or Trisomy 21. Rather than providing any actual diagnosis the test simply groups women as either high or low risk for carrying a baby with a chromosomal or genetic abnormality. Women at a higher risk are then offered further diagnostic tests. The developing baby has a layer of fluid between the skin and the underlying soft tissues on the back of its body. A measurement of the thickness of this layer, which is translucent on ultrasound, is performed at the region of the neck and is called the nuchal translucency measurement. There is evidence to suggest that there is an increased risk of both chromosomal abnormalities (e.g. Down Syndrome) and heart defects with increased thickness of the nuchal translucency. The test does not diagnose an abnormality, rather it suggests which pregnancies are at a higher risk of carrying an abnormality and may need further investigation. Therefore, a normal result does not guarantee a normal pregnancy but does imply that an abnormality is unlikely. Similarly, an abnormal result does not mean that the baby is abnormal but suggests that the baby should be further investigated. Are there any risks associated with having this test? No. The nuchal translucency test is completely safe as it uses ultrasound waves, which have been used for many years in obstetric examinations. Drink 1-2 glasses of water before your appointment. Please ensure you are well hydrated in the lead up to your appointment. Please have a moderately full bladder on arrival. Please do not empty your bladder before your appointment. It is not necessary to be uncomfortable but a moderately full bladder allows for a better scan. Continue to take your regular medication as normal. There is no need to stop your regular medication. Please continue to take as normal. The ultrasound scan is performed in combination with a blood test. The blood test measures the amount of free β-HCG and PAPP-A in the mother’s blood stream and ideally should be performed at about 10 weeks gestation. The nuchal translucency ultrasound is performed between 11 weeks 6 days and 13 weeks 6 days gestation but preferably at 12.5 weeks gestation. The blood test will need to be organised by your treating doctor. It is important that he/she gives you a referral for these blood tests and writes on the referral that you are having your nuchal translucency ultrasound performed at Perth Radiological Clinic. This ensures that the blood tests results are forwarded to our clinic in time for your appointment. The nuchal translucency ultrasound will take about 30 minutes to perform. Who will perform the test? Your ultrasound examination or scan will be performed by either an accredited Radiologist (a highly trained doctor) or an accredited sonographer (a specially trained technologist who has additional training in performing nuchal translucency scans). Perth Radiological Clinic has received its accreditation from the Fetal Medicine Foundation in the United Kingdom, which means we are able to perform the Nuchal Translucency Ultrasound examination at any of our comprehensive branches. 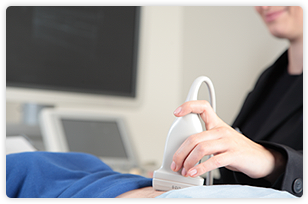 This examination should only be performed by an accredited sonographer or radiologist to ensure the most accurate results. The results from both the blood test and the nuchal translucency measurement, together with your age are incorporated into a specific computer program, which calculates the risk of your baby having a chromosomal abnormality. This risk is reported as a “1 in a specific number”. A low risk pregnancy is expressed as 1 in more than 300, whereas a high risk pregnancy is expressed as 1 in less than 300. What happens if I am given a high risk result? If your results suggest that your baby is at an increased risk of having a chromosomal abnormality you should discuss this with your referring doctor. The result does not mean that your baby is abnormal but indicates that further investigation may be warranted. In the majority of cases the pregnancy will be normal but it is important to discuss this with your doctor, who will be able to provide you with information and advice about further testing, for example chorionic villus sampling (CVS) or amniocentesis. Do nuchal translucency examinations qualify for a Medicare rebate? Not all requests for a nuchal translucency measurement will attract a Medicare rebate. Please discuss your Medicare eligibility with our reception staff when you make your appointment. Considerations for eligibility include maternal age, family history of fetal abnormality or other reasons for suspecting an increased risk of fetal abnormality. Please note: due to the high demand for nuchal translucency examinations a cancellation fee will be charged if you do not give at least 24 hours notice for a cancelled appointment. Please remember to bring any previous ultrasound or x-ray films to your appointment.